So after the past week you have seen posts agianst Darwinism, about Expelled (the movie), about academic freedom, and the differences between Creationism and Intelligent Design (ID). Constantly I remind you that I am a Creationist and not a proponent of ID. Why am I supporting it or giving it a fair chance? Why do I care? I am fighting for academic freedom. I believe in knowing all sides of the issues. I believe they should teach the controversy. I believe that idea of religion should be pushed aside a little bit and the science should be taught in classrooms. What I mean by that is I believe that in a classroom a teacher can be politically correct and teach Creationism, ID and evolution (all three sides of the debate) without pushing one side over the other. It must be done. The controversy must be taught without bias. Forget about religious views and show what each group believes. Today more and more students are coming out of schools ignorant. They are without knowledge and do not even know the difference between ID and Creationism. Students are coming out brainwashed in the ideas of evolution. People are afraid that if ID and/or Creation is taught in schools that their kids will come out brainwashed in those ideas….but they what they missing their own point, students are currently being brainwashed! 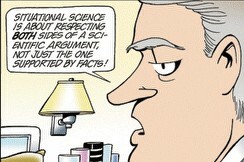 We need science taught objectively and all angles need to be presented. Yeah it would be difficult for a teacher to do, but it MUST be done! If students want to be religious that is fine. But in the classroom they should learn ALL sides. They can study and or be a part of the religion outside of class period, that is great. I want people to know that facts and know the truth. I think the truth will really set people free. I believe that when presented with ALL angles, ALL sides, that people will make their own choices. People will follow the evidence and find what really is Truth, but when only ONE side of the story is giving at school, students are ignorant. Society is ignorant. All I am asking is that we should have the freedom in America to study ALL vantage points in schools. If professors do not have the right to study intelligent design, how will the general public ever legitimately study Intelligent Design (ID)? Also how will we anyone illegitimately come up with “evidence?” If you believe that there isn’t any credible evidence why do you care if people study it or not? The point is that I am angry about the close-mindedness and elite “big science” that does not even allow for study of ID. In all seriousness I am not an ID proponent. I do not believe in it at all. I am a Creationist. But I want to know what it is about. I want everyone to have the right and freedom in America to study ID freely, just as they should have the right to study evolution or Creationism or whatever. You might say that “there is no credible evidence for Intelligent Design.” Well that is fine, why though should people be kicked out of a job for mentioning ID? If the evidence is so bad why not encourage people to study it? What do you have to loose? Are you afraid that evidence will destroy your beloved “evolution argument! ?” And if it does, so what? Why not allow people to follow where the evidence leads? Maybe it will lead to evolution, my point is let people study all angles and all sides of the debate! I am ticked because there are plenty of false lies that Universities are teaching as facts, and people are free to learn about them! For example, theories in social sciences like psychology and sociology. Everyone learns about them and yet everyone studies them. They are even told how these theories are flawed and sometimes these theories are supported with evidence. The point is both sides of the story are presented and professors and students are free to learn about them… but ID on the other hand is not allowed. My heart is crying out about academic freedom! Please do not be so close-minded and say that because there is no credible evidence that no one should be allowed to learn about it, because that is elitist and close-minded. Theories that are not supported are the foundation to everything we have every studied. Our nation is build on learning and having the freedom to learn and study everything. Science in American history shows that experimenting and studying theories that might be false is the best way to learn what is true. I want to have the freedom to find out what is true. I want to study all aspects freely in America. How is it that Evolution and Darwinism are just theories and the are not supported with hard evidence but no one is giving them a hard time? Yet when people mention other unsupported theories say Intelligent Design, minds are closed, institutions lock the doors and theories are crushed..